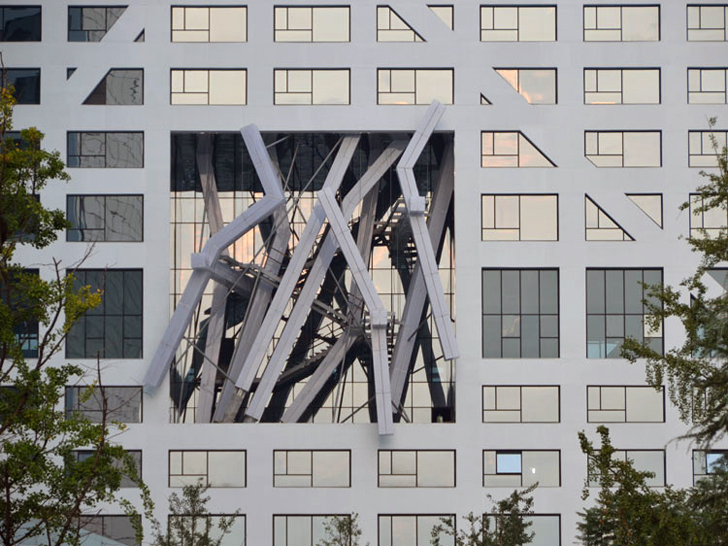 <a href="http://www.stevenholl.com/project-detail.php?id=98&amp;search=porosity" target="_blank">Steven Holl Architects</a> just announced the completion of the chunky mixed-use <a href="https://inhabitat.com/steven-holls-sliced-porosity-block-tops-off-in-chengdu-china/" target="_blank">Sliced Porosity Block</a> in China. Designed with an emphasis on daylighting, the project consists of five uneven geometric structures separated by open spaces that allow light to filter into a lush inner courtyard. Inspired by canyons and valleys, the project is targeting <a href="https://inhabitat.com/berkeleys-leed-gold-designed-energy-bioscience-building-leads-by-example/" target="_blank">LEED Gold status</a> with a mix of energy-efficient technologies including geothermic heating and <a href="https://inhabitat.com/tag/rainwater-recycling/">rainwater recycling</a>. 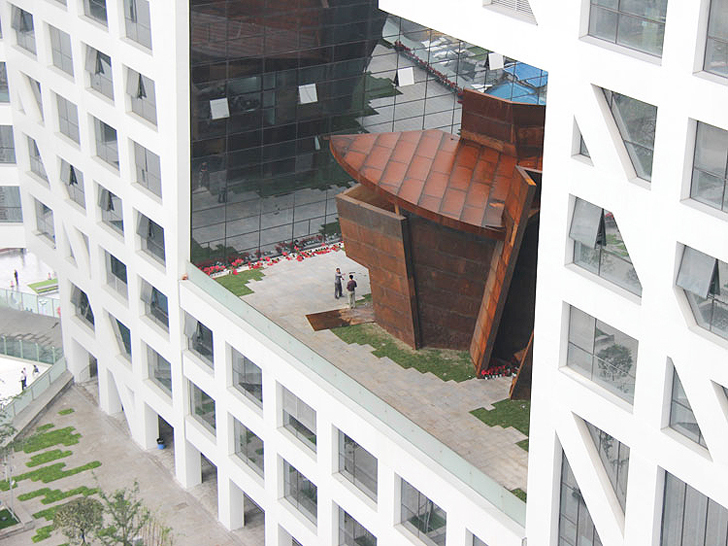 The recently completed Sliced Porosity Block is located in Chengdu, and <a href="http://www.stevenholl.com/project-detail.php?id=98&amp;search=porosity" target="_blank">Steven Holl</a> took inspiration from historic local poet <a href="http://en.wikipedia.org/wiki/Du_Fu" target="_blank">Du Fu</a>'s Three Valleys. 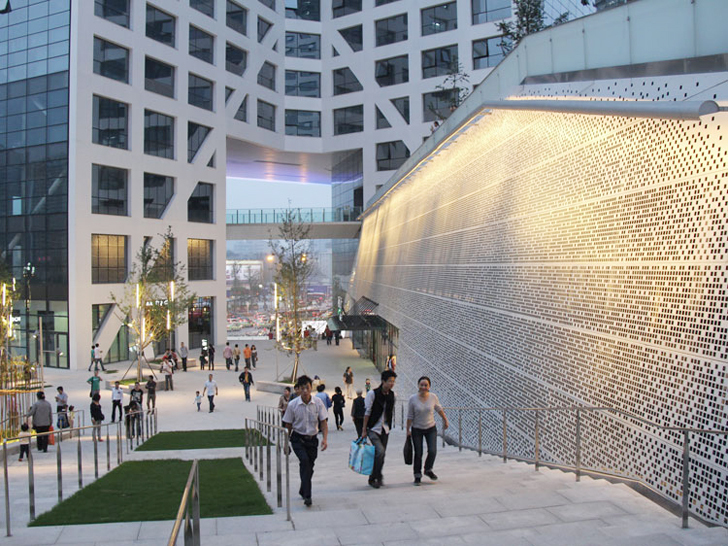 With this poem in mind, Holl created three plaza levels that represent the valleys - each with water gardens representing the fountain of the Chinese calendar year, the fountain of twelve months, and the fountain of thirty days. 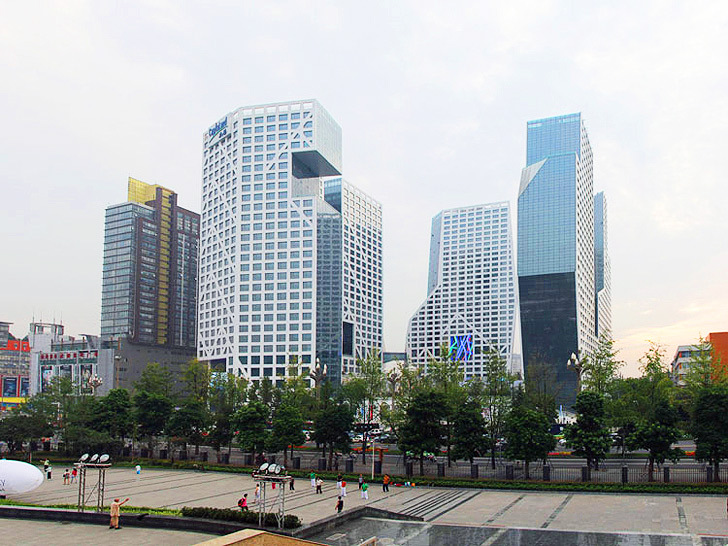 The plaza ponds <a href="https://inhabitat.com/solar-tube/" target="_blank">double as skylights</a> for a shopping mall below, refracting and distorting the daylight as it travels through the water. 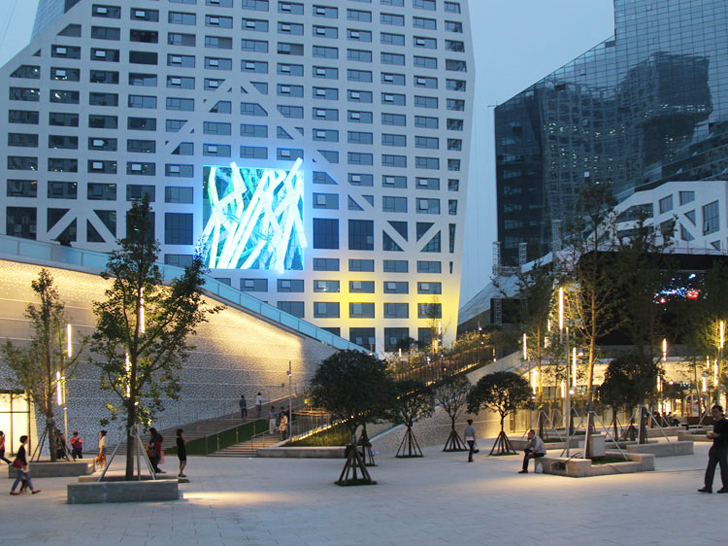 Three entrances into the three million square foot complex double as pavilions - one for history, a local art pavilion, and a light pavilion designed by <a href="http://lebbeuswoods.net/">Lebbeus Woods</a>. 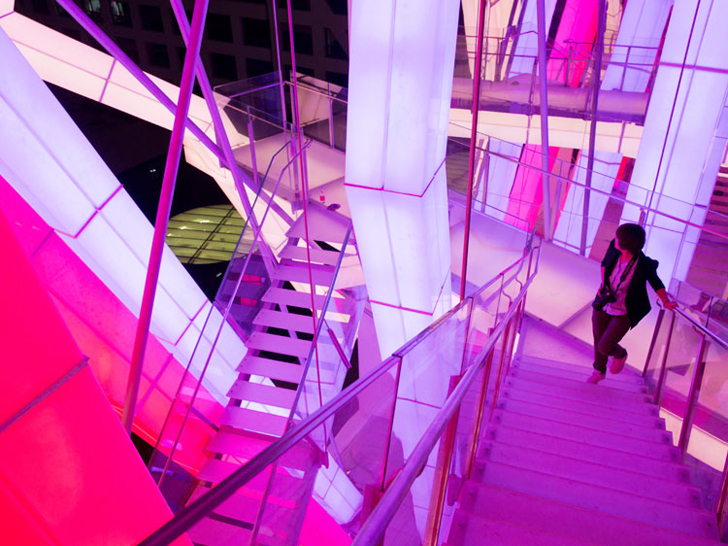 These openings give the public access to the<a href="https://inhabitat.com/nyc/bigs-west-57th-pyramid-is-a-cross-between-a-copenhagen-courtyard-and-a-nyc-skyscraper/" target="_blank"> interior plaza</a>, park and pools, which cascade on varying levels in the courtyard. The pools are filled with harvested rainwater, grasses and lilypads which naturally cool the area. The complex's facades are made up of concrete and high-performance glazing that blocks solar gain while allowing ample natural light to filter inside. Heating and cooling is provided by 480 <a href="https://inhabitat.com/ten-geothermal-wells-heat-and-cool-this-swooping-blue-ridge-house-in-virginia/" target="_blank">geothermal wells</a>, and energy-efficient technology and appliances are featured throughout. The Sliced Porosity block brings a bevy of apartments, retail spaces, restaurants, a hotel and public space to the neighborhood while keeping the block open, airy and full of natural sunlight. 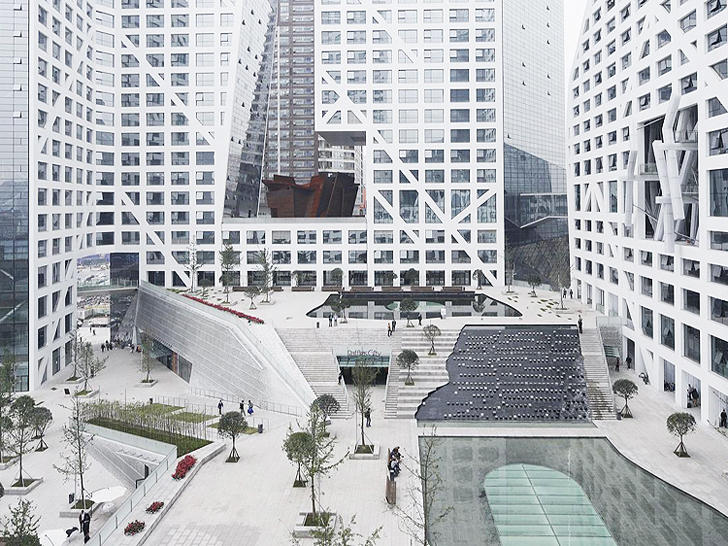 Steven Holl Architects just announced the completion of the chunky mixed-use Sliced Porosity Block in China. Designed with an emphasis on daylighting, the project consists of five uneven geometric structures separated by open spaces that allow light to filter into a lush inner courtyard. Inspired by canyons and valleys, the project is targeting LEED Gold status with a mix of energy-efficient technologies including geothermic heating and rainwater recycling.